According to their website "...Uche Isichei Architects are a small design oriented architectural practice offering creative solutions to our clients. We are committed to creating fantastic living and working spaces that enhance the lives of our clients. Our projects are designed responsibly using ecologicaly sustainable materials and “green” design strategies like passive solar heating. We design a wide range of projects and are happy to talk to you to find out what we can add to your project...". Photos courtesy of Uche Isichei Architects. Stefan+Antoni+Olmesdahl+Truen are a team of architects whose style consists of a fusion of vernacular and contemporary design with a tint of minimalist architecture. HABITAT Magazine says "..The Architectural and design team responsible for this exemplary residence were appointed by their client to create a double dwelling development in Greenpoint..."
Photos courtesy of Stefan+Antoni+Olmesdahl+Truen website. 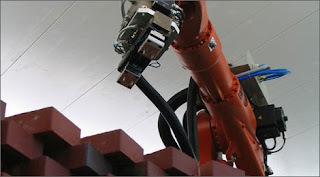 According to Monocle magazine "...The Gantenbein Winery, in Fläsch, Switzerland has been the prototype for an entirely new approach to bricklaying: using modified industrial robots. Traditionally, the promise of industrial robots has been that they would replace the human workforce. But these projects, led by the Architecture and Digital Fabrication laboratory at ETH Zürich, demonstrate a different result: architects are free to create designs and patterns of a precision that simply could not be achieved by hand. Monocle spoke to Professors Fabio Gramazio and Matthias Kohler, who have been collaborating on the project with partners Keller AG and Bearth & Deplazes, about what it means for both building and buildings, and the industry's initial reaction to a prospective army of robot builders..."